Continuing this month’s (quite accidental) theme of “lasts” associated with historical events, here’s another one. Today marks the 48th anniversary of the Beatles’ last live performance (1966). 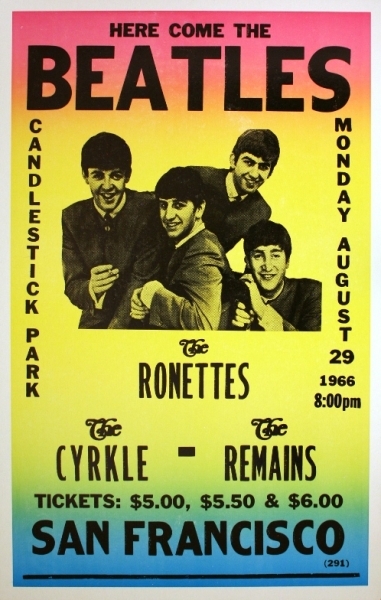 They appeared at Candlestick Park in San Fransisco. The Beatles broke up as a band in 1970, but all of them went on to enjoy independent career success. Rolling Stone ranked the Beatles as the greatest artist of all time – not bad for a band that lasted only ten years. The Rolling Stones (the band, not the magazine), as an example, are still technically in business and they formed in 1962. There are many bands who have lasted a lot longer than a mere decade.